Julian Serrano is a truly authentic yet modern Spanish restaurant. Plus, it's got all the style and sophistication that you might expect from modern-day Vegas, but without all the pretense. If you'd like the inside scoop on this fashionable restaurant -- complete with tidbits like how to dress, where to get the best seat for your specific occasion and what to expect when you visit the restroom (a complete yet whimsical surprise) -- please read on. Reservations are strongly recommended, if not required, and can be made by calling the restaurant directly or by clicking the "Make a Reservation Link" on ARIA's website. Julian Serrano has several seating options. You can dine at the bar or in the lounge area, for instance; you can dine watching the open kitchens; or you can dine in the slightly more formal area of the restaurant. In the more formal area, tables for two or four are 46 inches in diameter -- some of the largest we've seen. They also are generously spaced throughout the restaurant, in case you're worried about being on top of your neighbor. In the bar, the chairs are medium backed, have dark frames with a mesh back and are upholstered in brown, the final touch being chrome that connects the dark framed legs. In the less formal dining area, which spans both sides of the L-shaped restaurant, chairs are dark wood with circular backs and black leather seats. In the fine dining area, Spanish designer Jamie Hayon's chairs are 24 inches from arm to arm and 16 inches on the seat, as the arms gently glide out and up giving you more room. 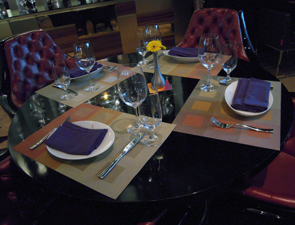 The chairs are upholstered with wine- and gold-colored fabric and have a black lacquered back. They're so comfortable that one could probably sit in them all day. There also are metallic colored banquettes and large leather armless seats with chrome feet and a small round pillow for your lower back. All are truly comfortable. Julian Serrano emanates a stylish sophistication. It is truly a Spanish restaurant, but instead of bull-fight décor it has a happy, contemporary feel that's made even more jovial by the use of bold colors, such as purples, golds and oranges. The ambiance is one of in vogue elegance -- the best of a congenial tapas bar where you can linger all day if you like, or grab a quick bite if that's what you need. You've got casual, formal or bar dining; it's all up to you. It's fun for both a bite with a friend and a business meeting; either can work beautifully. Julian Serrano has the perfect general manager in Stewart Patchefsky, formerly of Alex in the Wynn. Under his direction, service is seamless and no detail is overlooked. Our server, Francisco, could not have been more helpful or nice. Our meal was served with perfect timing and his suggestions were spot on. Never did we want for anything, as his eye was constantly on our table -- without intrusion -- anticipating our every need. Because music plays in the restaurant and adds to the jovial atmosphere, if you have a private matter, the more formal dining area is the most appropriate. The restrooms have same-level access as the main dining room and are located off the main entry, where they are a model of beautiful tile. Be prepared for an experience: In addition to music, Spanish lessons fill the air so that those visiting the restroom can learn the Spanish equivalents for such essential phrases as "I'm thirsty," "I'd like a glass of wine," "I love you," "Call me" and "Sweet dreams," among many other indispensible phrases from an unending loop of music. The required dress code is casual, but as with any nice restaurant, please use discretion. Gratis valet parking is available at ARIA Resort & Casino, as is gratis self-parking. There are also multiple cabs available at the hotel and a tram to travel between CityCenter properties. Julian Serrano is a two-time James Beard Award Winner, having won "Best Chef California in 1998 and "Best Chef Southwest" in 2002, when he was the first Las Vegas chef to secure that honor. His other restaurant, Picasso at the Bellagio, is a nine-time recipient of the AAA Five Diamond Award, from 2002 to 2010, and is a recipient of the Wine Spectator Magazine Grand Award. Speaking of wine, Julian Serrano won the Mondavi Culinary award of excellence in 1999, soon after opening Picasso in 1998. Because Julian Serrano, the restaurant, has just recently opened, it hasn't yet received any awards, although we believe it's only a matter of time before it begins collecting accolades.